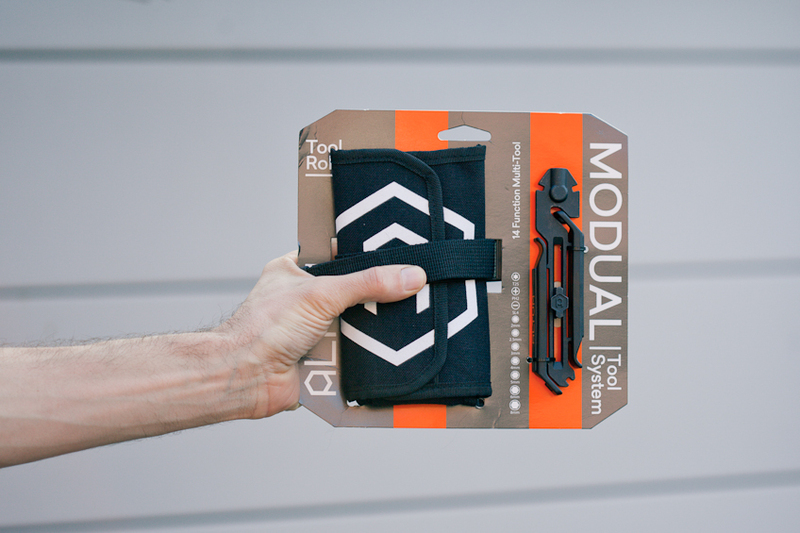 Derived from the wellknown crowdfunding website Kickstarter.com, the Modual Tool received plenty of backing in a month’s time. Now, it’s readily available via www.altum.cc where the Modual Tool System (MTS) and the Modual Tool Roll (MTR) are sold separately or as a combined set. 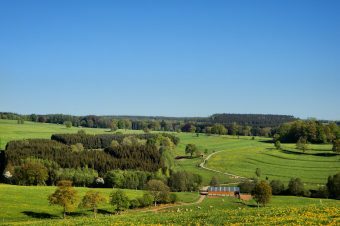 Let’s start with the tool itself. 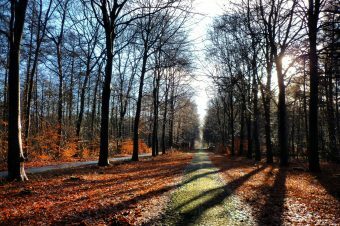 You probably already figured out it is a bit system. However Altum Designs did something clever. Put a bit in the top of the tool and you’ve got something of a screwdriver for working fast and access hard to reach places. Or put the same bit in the side of the MTS and use it like a wrench. The tool is long enough to provide a lot of leverage. 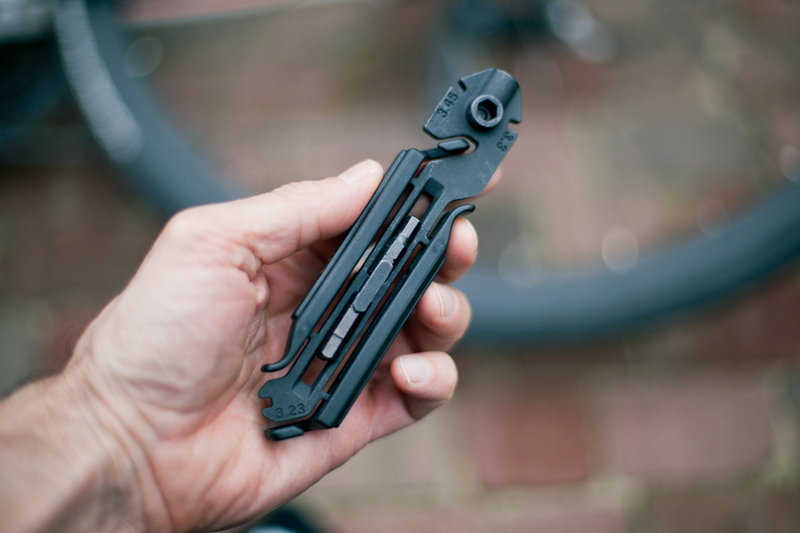 Much more than your standard folding bike tool. 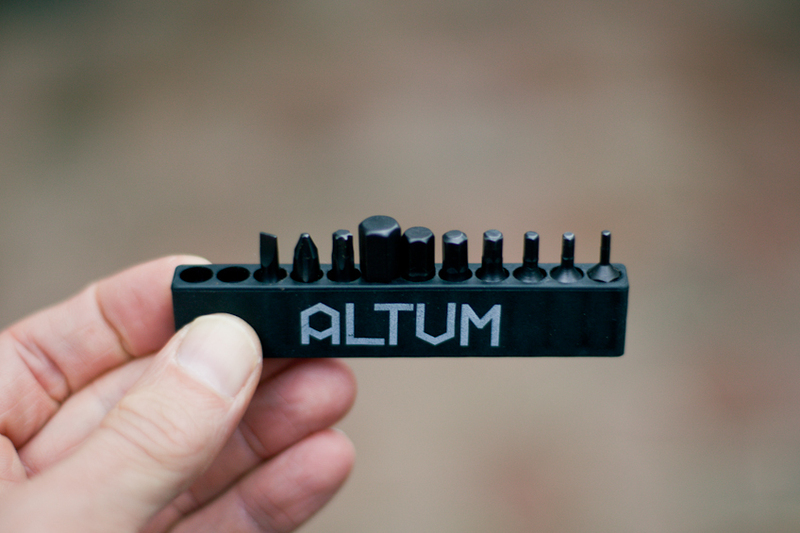 As for the bits, Altum Designs include 10 seperate bits: hex tool (2, 2.5, 3, 4, 5, 6 and 8), a T25 torx, a philips and a flat head screwdriver tool. In the supplied rubber holder there is room for two more bits if you would like. Also included is a bit extender. Much like the bits itself this a pretty standard tool, which is an advantage since you can easily replace parts if they might get lost. Incorporated in the tool are three spoke keys (3.23, 3.3 and 3.45mm) and four of the bits can be magnetically housed inside the tool. Sadly on most bikes, Lemmy knows why, four tools is not nearly enough. Another nice feature are the two tyre levers. They are made from glass filled material for extra stiffness and also attatch magnetically to the tool itself. 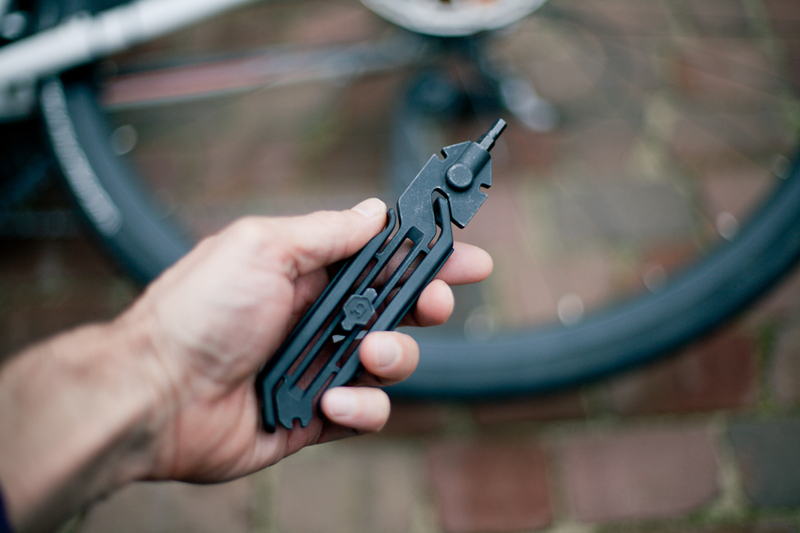 This leaves a clean looking and compact tool including those odd shaped levers. According to Altum Designs the levers form an ergonimic handle, which is true to a certain point. Once your hand goes past the even part of the levers they pop up like a … well … lever. So I take them off most of the time and reattach them when I’m done. It works just as fine. In case they go missing, the levers are sold seperately too (£2.99 for 2). 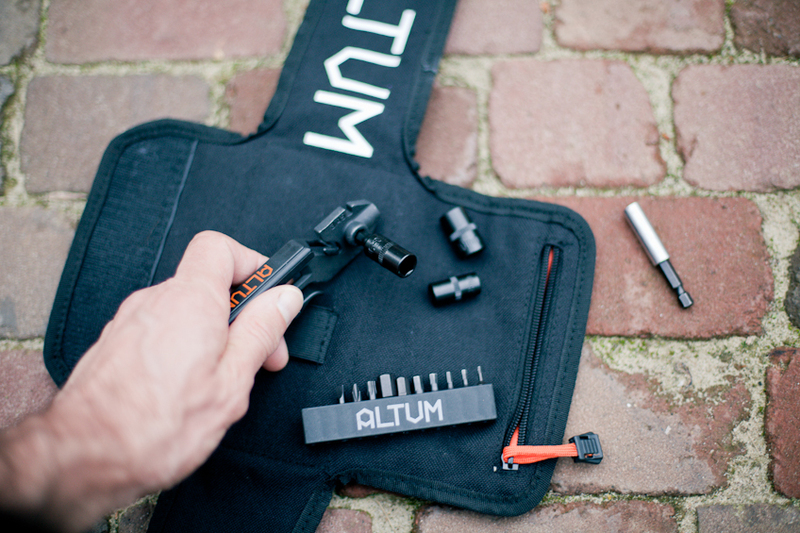 Altum Designs put a lot if thought in their Modual Tool Roll, or MTR, made from hard-wearing Cordura. When you are done, just slide the tool in the elastic band on the center part. It sits quite firm in there. Next fold the flaps over each other. Simple as that. One of the large flaps has a zipped pocket to stash the tool bits, the extender, some patches, your money and much more. 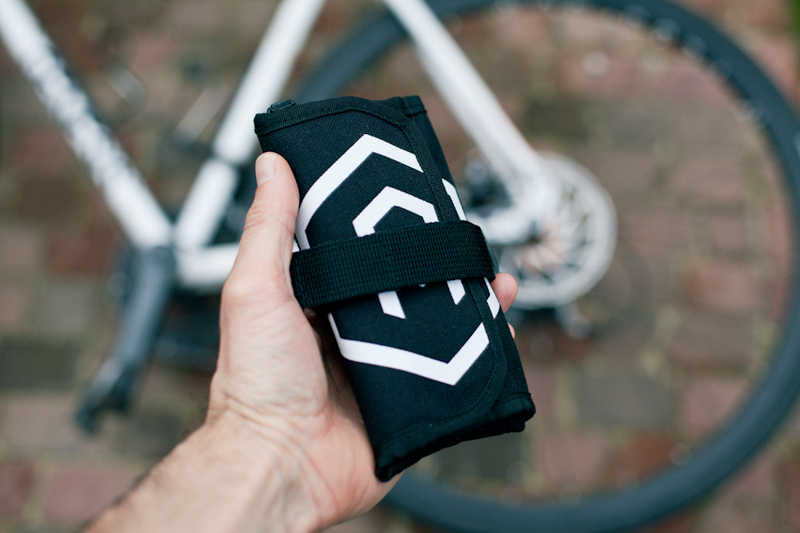 On the outside there is another, larger elastic band that holds a spare inner tube. 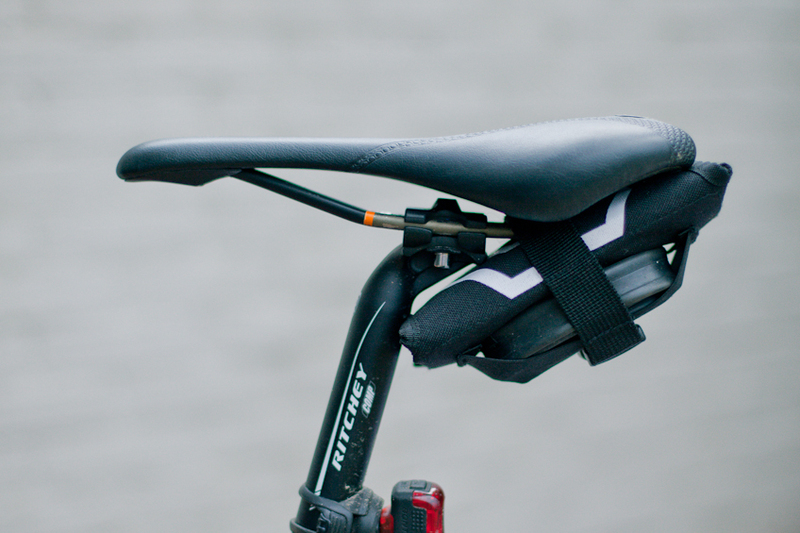 Then, strap the whole thing with a buckle and velcro strap to your saddle rails. Although it’s a nice looking package I found it a bit large for a Sunday morning spin. Viewed form the side there’s no problem and it looks much cleaner than a standard saddle bag. 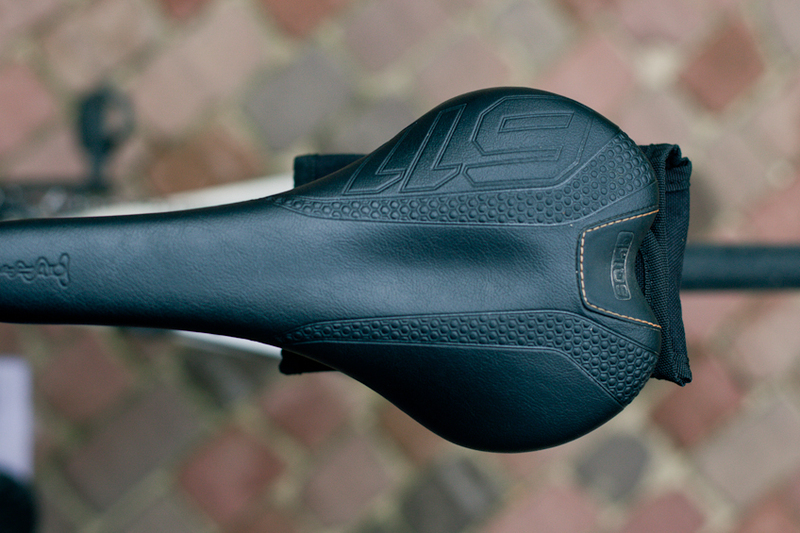 But from the top of the saddle you can see the tool roll sticking out. 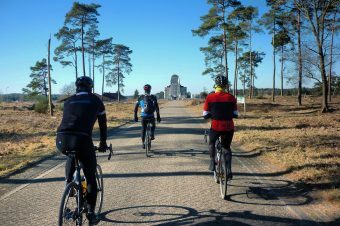 I like to switch riding positions on the saddle and sitting on the back of the saddle my upper legs touched the tool roll, albeit only slightly. Putting it in your jersey’s back pocket might be a better option. 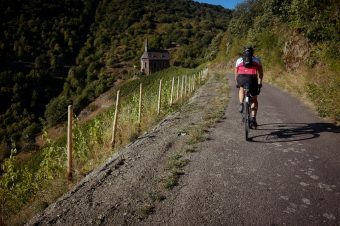 When going on a multi-day bikepacking adventure the MTS and MTR are of great value. 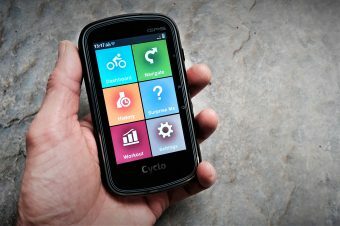 First of all you have a reliable tool at hand, which can be customized to your bike. Packing for a longer tour the larger tool roll becomes and advantage. You can keep all of your spare parts together: a chain link, spare brake and shifter cables, mini bottle chain lube and so on. Roll out the MTR and use it as your work mat on the go. 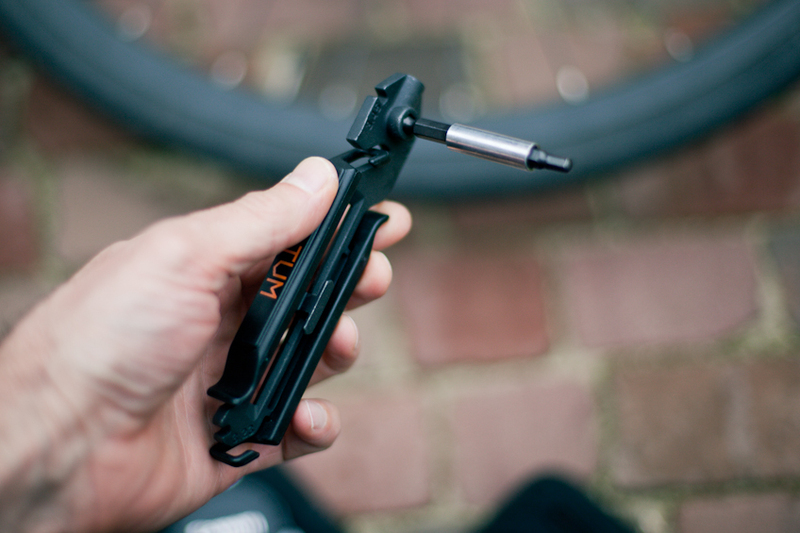 The Modual Tool System is an all-in-one bike tool which can be custumiozed with different standard tool bits. 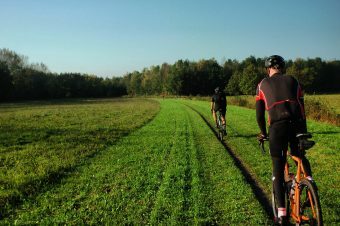 The srewdriver mode and wrench mode are a very clever solution for working fast and access hard to reach places. The tyre levers housing inside the tools are great for storing them, but when using the tool I prefered to take them off. 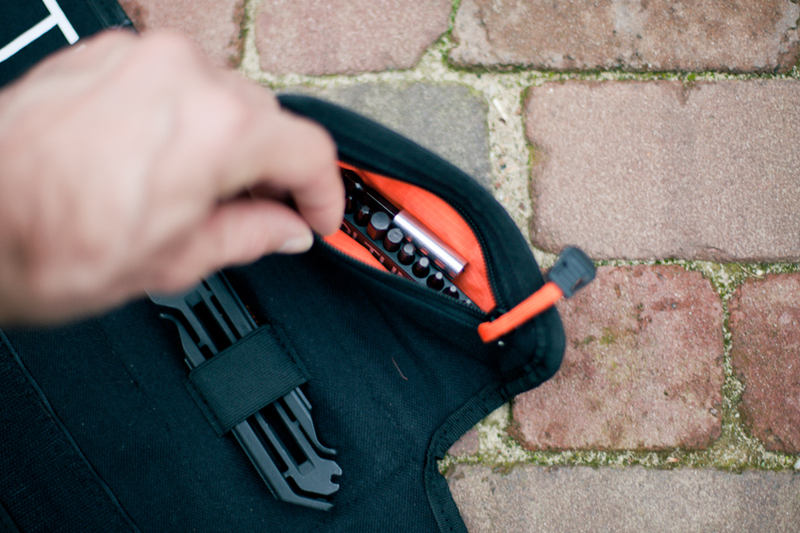 The Modual Tool Roll is a clever solution too with a large zipped pocket for storing the bits, bit extender and a lot more. A point of attention is its size. All rolled up it is fairly large. If you are a minimalist or weight weenie, this isn’t your tool system. 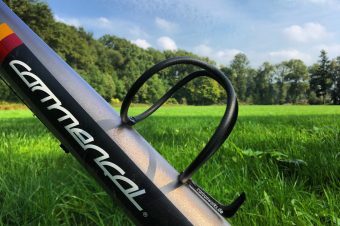 If you are going out on a multi-day adventure and want an all-in-one solution for fixing your bike in the middle of nowhere, the Modual system might save your life, or at least your day.